The Best Choice for Counter or Carrier Service! 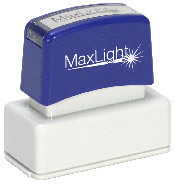 provides up to 50,000 initial impressions and can easily be re-inked for thousands more. Soft touch handle and protective dust cover included.